It is that time of year for an important reminder . 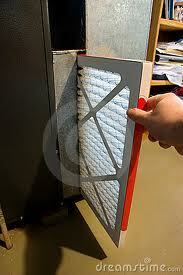 . . don’t forget to change your furnace filter regularly. We’re half way through the heating season and if you haven’t changed your filter yet this season now is a good time to check this off your to do list. While it is not glamorous – it is really important and here is why. Your filter does two things. First – it traps dust and dirt, keeping it from getting into the motor and other components of the furnace and also helping to extend the life of your furnace. Second – by trapping the dust and dirt it also keeps it out of your home. This is important over the winter months when we tend to keep the windows and doors of our homes closed. The dust and dirt that can come from a dirty filter is more noticeable in our homes when we aren’t able to open the windows and get the fresh air so many of us enjoy during the spring and summer months. So remember to check your filter every month, and depending on the type of filter in use in your home change it as recommended. Don’t know what type of filter you need? Click here – this article is a great resource. If you need any assistance in changing your filter or have any questions let me know and I’d be happy to help. This entry was posted in HVAC and tagged change furance filter, check furance filter, furance filter.